Apple will meet with the Swiss Federal Railway to discuss the railway’s accusations that Apple stole the design of its trademarked clock for the iOS 6 clock app on the iPad. The Swiss Federal Railway doesn’t seem too ticked off (pun intended) at Apple’s use, but still wants to work out a deal with the iPhone maker. A spokesperson told the AFP that it did not mean to “upset [Apple] by asking for money” and that the railway was pleased its clock was used in the first place. “There’s been no agreement so far, we’re going to talk about it,” a spokesperson for the railway told AFP. The spokesperson said it isn’t about money, but rather “drawing up a contract” discussing where Apple is allowed to use the clock, and for how long. 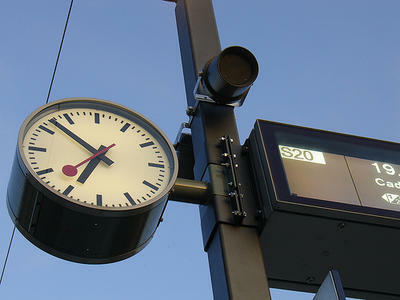 According to CNET, the Swiss Federal Railway, better known as the SBB, originally trademarked the clock in 1944 after an employee by the name of Hans Hilfiker designed it. It’s unclear what will come as the result of the talks, which are scheduled to occur in the coming weeks, or days, but we imagine Apple won’t be retiring the design anytime soon.